1st Bn, Princess Charlotte of Wales's (Royal Berkshire Regiment), 99th Brigade, 2nd Division, B.E.F. Next of Kin: Only son of Captain Francis Alan R. (Alan) Bowles, Royal Navy and Ann Caroline his wife, of Dully House, Sittingbourne, Kent. Alan Bowles, the son of a naval officer was born in Sheerness, Kent. The 1901 Census records that at that time the family were living at 3 Merton Road, Portsmouth. The birthplaces shown reflect a naval life: Ann Bowles was born in India, her first daughter Frances (age 8) was born in Bermuda, Alan and Anna were both born at Sheerness. 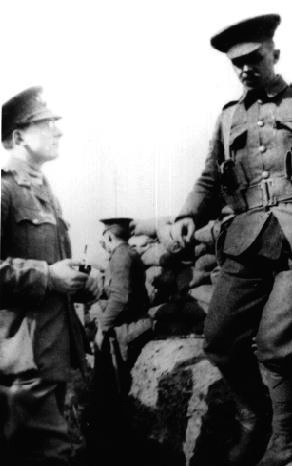 Allan Bowles joined ‘A’ Company, 1st Royal Berkshire Regiment at Montmorency Battacks, Bethune on the 11th March 1915. In April of the same year, he joined 6th Brigade Staff. On 28th October of the same year he was posted to the 2nd Royal Berkshires and was promoted to the rank of Captain. He was killed in the trenches along with 2/Lieut H Davies and 3 men on the 10th April 1916. Becourt Military Cemetery, in which Captain Bowles is buried, was begun in August, 1915, by the 51st (Highland) Division, and carried on by the 18th and other Divisions in the line until the Battles of the Somme, 1916. It continued in use, chiefly by Field Ambulances, until April, 1917; and Plot II was made by the 18th Division at the end of August, 1918. There are now over 700, 1914-18 war casualties commemorated in this site. The cemetery covers an area of 4,327 square metres and is enclosed by a rubble wall.